As the beat repeats over and over, my thumb presses down on the D-pad along with my tapping foot. I watch my character hop from one square tile to the next in perfect rhythm; quickly knifing a slimy blob of goo, as the rest of the enemies bounce around to the music. I suddenly encounter the boss of the level and with the pressure on me, I lose my rhythm and shortly after my life. 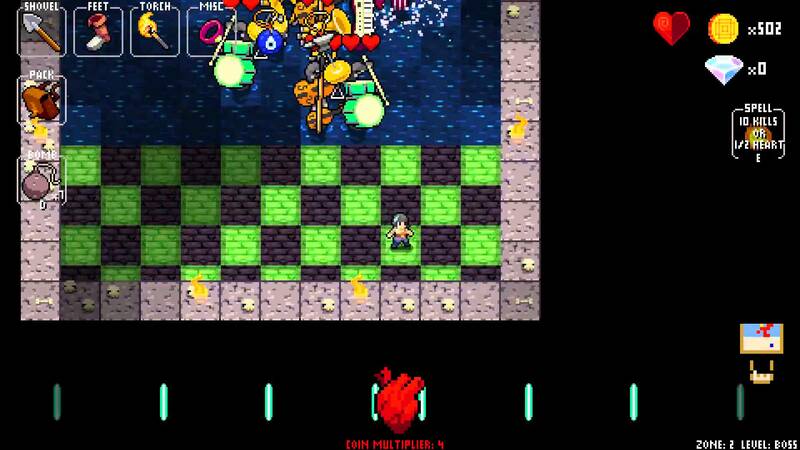 This is Crypt of the NecroDancer, and in this game you must dance to the beat to survive. 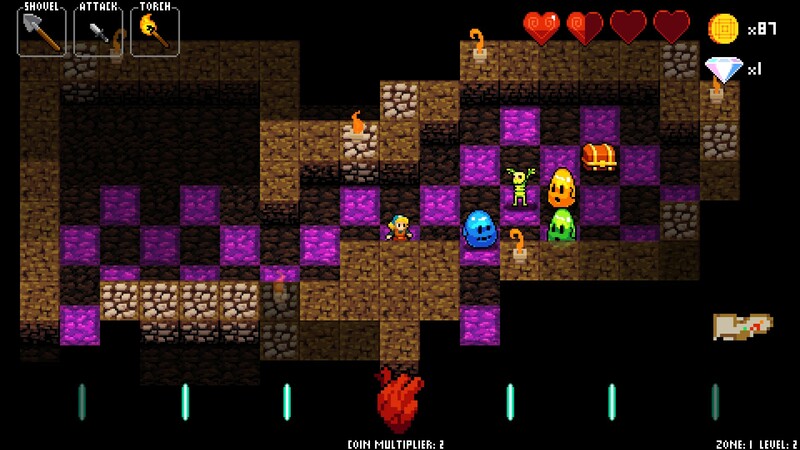 Crypt of the NecorDancer is a roguelike dungeon exploration game with randomly generated levels. 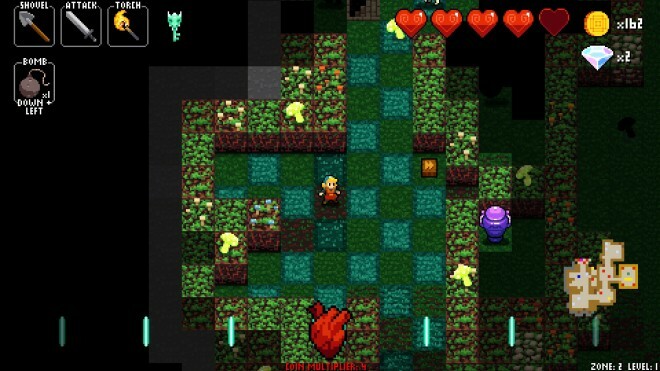 Randomly generated roguelike games are not new, but what sets Crypt of the NecroDancer apart is the game’s emphasis on having players move to a singular rhythmic beat throughout each level. Everything follows this beat including enemies, which each have their own movement pattern or “dance move” to the beat. The longer players move and attack while remaining in sync with the game’s beat; the more riches players will get to spend on items to help them get deeper into the dungeon and move to new levels. Crypt of the NecroDancer is still a roguelike though, which means that players better get ready to die and start from scratch many, many times. When first starting out in Crypt of the NecroDancer, I was a stumbling mess as the dungeon and its monsters quickly showed me what they had in store, however, after getting into a groove with the game, I danced my way to the top and had a whole lot of fun on my way there. Great music – For a game that centers around a single beat and having the player keep rhythm, you would hope that the music is at least good. Luckily, NecroDancer’s soundtrack is great. There are a variety of excellent tracks that players can expect to hear many times over that had me bobbing my head side to side and enjoying the electronic soundtrack. The music manages to sync up well with the constant beat that players are meant to follow, and never did I feel as if the music itself was screwing up my rhythm. I thoroughly enjoyed the soundtrack of NecroDancer and even though I heard the tracks dozens of times, I still never got sick of hearing them. Plenty of dance moves – Crypt of the NecroDancer has a lot of content contained within itself, with a variety of modes and characters for players to discover. 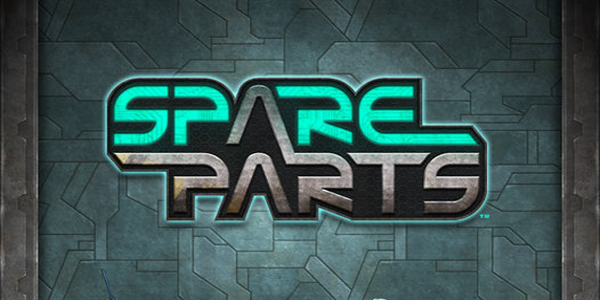 The game has a story mode which has you playing through the story of three characters. There’s also a more traditional roguelike mode, where players explore separate zones of the game and earn upgrades for future runs of the dungeon, along with a endless mode and a co-op mode. While exploring and playing through these modes, players can find new characters to unlock that can radically change how to play the game. These characters range from one that doubles the speed of the beat that players will follow to a character that only uses bombs, along with a handful of other unique characters that have a variety of specific traits. With each character offering a different playstyle and the variety of modes available, there is plenty of content stuffed into the game. A fun challenge – I’ll be the first one to point out that Crypt of the NecroDancer is a challenging game that isn’t afraid to end your golden run in a blink of an eye. Even with that challenge, however, the rhythmic exploration of the game is very enjoyable. Trying to maintain your multiplier by staying in sync with the beat and figuring out the best approach to a room of enemies while gaining better equipment, is a very satisfying and fun gameplay experience. The sense of satisfaction for me was enhanced whenever I would progress further in the game. The challenge of Crypt of the NecroDancer is on par with other roguelike games, but the exploring and the satisfaction of slowly progressing deeper into the game help make the challenge a little easier to swallow. Stick and d-pad problems – One of the issues that I have with the game is less an issue with the game and more an issue with the controls and the Xbox One controller. Using either the left control stick or the D-pad is not the ideal way to play the game, as occasionally the game would fail to register a button press or other stick input I would do. This would lead to me losing a multiplier or even at times not moving out of the way of an enemy attack. I even tried a separate controller and still encountered this problem. This control issue definitely won’t hurt the experience of the game overall but it can be annoying when it does happen. I found myself using the Xbox One D-pad to move around as it was slightly more reliable than the control stick, but it is obvious that the game plays better with a keyboard rather than a controller. It won’t damage your fun with the game, but the random moments of failed movement input can be irritating. 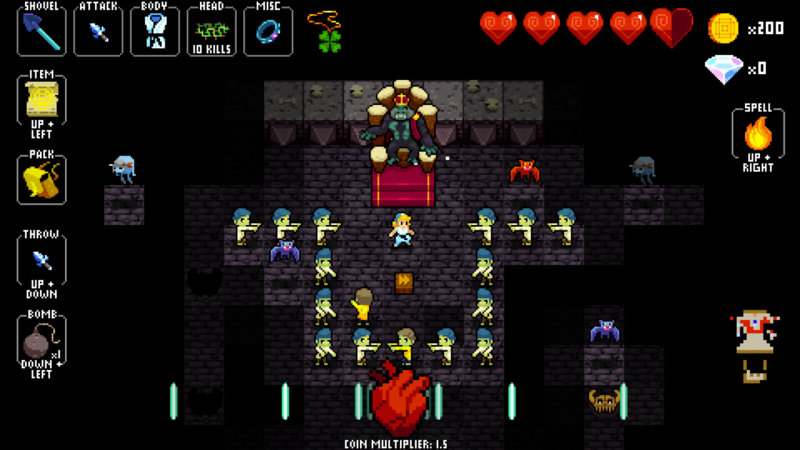 Crypt of the NecroDancer separates itself from other roguelikes thanks to the rhythmic beat gameplay and the variety of content available for players to mess around with. The games soundtrack will keep you playing and coming back to the game so that you can hear that one particular track again. 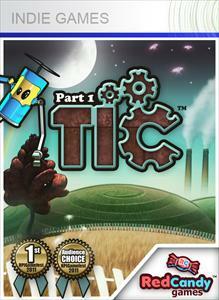 The level by level exploration of the game is fun once players get used to the beat of the game. There is a lot to like with Crypt of the NecroDancer and most players will find some aspect of the game to get hooked on. Crypt of the NecroDancer was developed and published by Brace Yourself Games on Xbox One. It released on February 9, 2017, for $14.99. A copy was provided for review purposes.